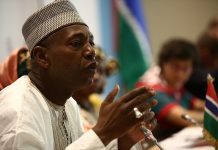 The relationship with the Ukraine kicked off in the last decade of the last century when I was offered scholarship by the Gambia Government to pursue undergraduate and postgraduate studies in the then Soviet Union precisely in 1990, after a two year glorious teaching career at the then Gambia High School . These were very interesting and tumultuous times and the former Soviet Union was in the throes of perestroika (restructuring) and glasnost (openness) – a reform process that was to have significant ramifications for the Soviet Union, Eastern Europe and indeed the whole world. Thanks to this process which was unleashed by then Soviet President Mikhail Gorbachev the Berlin wall came down, Germany united again and the iron curtain was folded thus effectively ending the cold war, much to the delight of the East Europeans who were forced to live behind the iron curtain since the end of the Second World War in 1945. Ukraine and other constituent republics of the former USSR such as Russia, Belarus, Moldova, and Azerbaijan etc hosted Gambian and other African students since the early 60s, the highlight of which was the opening of the Patrice Lumumba Peoples’ Friendship University in Moscow purely for students of the third world in 1962. However, my generation was one of the last batches, given that the Soviet Union collapsed right before our eyes in 1991 and the newly independent states including Ukraine did not have the appetite to provide and sustain an army of foreign students in their countries. The underlying currents responsible for the dismemberment of the USSR were many and varied and these have been adequately documented by historians, as such it is not necessary to delve in to the details. But I did mention in another piece that the Soviet Union collapsed not for lack of infrastructural development or scientific advances , but in my view due to lack of pluralism and divergent views in the body politic as well as economic stagnation at macro and micro levels. Ukraine – a country located on the eastern fringes of Europe with 46 million inhabitants is a much endowed nation and used to be the bread basket of the former Soviet Union. The people are highly talented, industrious, educated, proud and the women folk (devushek) extremely beautiful ( krasivaya). The country is equally endowed with vast natural resources including iron ore, coal and the soil is black as the country is located on the black earth zone of the world (Chernozeme) with rich and vast agricultural farms across the giant steppe. Bread ( kleb) and Irish potato ( Kartoshka) the staple food come in various forms, colours and shape and were never in short supply, including juicy apples(yablaka), succulent fruits and dairy products such as ‘malako’ (milk) “kefir” (sour milk) and “smitana” (creamy natural yoghurt) which are in abundance and in high demand. In terms of culinary delights Ukrainian food was exotic and my favorite delight was “borsh” – a soup like stew mixed with cabbage, meat(miasha) or pieces of kalbasa(sausage) and tomato paste, and very nice when served hot with “churnih kleb” (black bread) which is the favorite bread in Ukraine. Given the harsh weather condition of the Ukraine with freezing temperatures during the long winter months “borsh” is usually very “polesni”! (useful) during the evenings. And while I pursue my “uchurba”(studies) at the Taras Shevkhenko Kiev State University (1990 – 1996), the opportunity was seized to immerse in Ukrainian/Russian culture, studied the ancient history of Kievskaya Ruus- the cradle of Ukrainian and Russian civilization, read the works of the great Ukrainian nationalist and poet Taras Shevkhenko as well as the legendary Russian literary giants such as Tolstoy, Pushkin, Tchaikovsky and the exploits of Bogdan Khmelnitsky- the great Ukrainian leader who presided over the unification of Ukraine with Russia in the mid 17th century. At the same time interacted with a vast array of Ukrainians including the talent pool of intellectuals such as the folksy Professor Gumenyuk, Dr. Manshola – another erudite and suave professor of International Relations and foreign policy, Professor Pashuk who later served as Ukrainian Ambassador to Argentina, Dr Martinenko – the erudite professor of Political Science as well as Dr Rizhkov – the ever affable professor of diplomatic strategy and principles of Diplomacy. Our hostels affectionately called “obshezitiye”, (communal residence) ranging from 1-15 (hostels) which were located in the sprawling Lomonosova district in the outskirts of Kiev were lively dwelling places of abode with a mix array of students from all corners of the globe including Arabs, Chinese, Latinos and Africans. The lingua franca was Russian and this facilitated interaction within the diverse student population from different continents and regions with different socio- cultural orientations and languages such as Arabic, Spanish, French, English, Chinese, and Vietnamese etc. Every other weekend there were “deng rasdenia prasnik/vecher” (birthday celebrations) organized mainly by students from Asia, but African students as well, and the objectives were to lure the beautiful Ukrainian girlfriends (padrugas) to the hostels for party sessions and to animate the hostels. That notwithstanding, the foreign students strove hard to overcome language barriers, and in this instance speaking both colloquial and formal Russian and studied hard to meet the stringent requirements of the Ukrainian professors. Apart from the occasional racial remarks such as “abizian” (monkey) usually directed at African students by certain xenophobic and unexposed Ukrainians mostly young boys and drunken men; the wintry conditions and the serious economic challenges faced by the foreign students; the Ukrainian experience was by and large very interesting and rewarding. Despite the odds, the “innostrani studenti”(foreign students) soldiered on and graduated in our chosen fields armed with the requisite knowledge and exposure to serve our countries. This we continue to discharge with distinction and as such I rose through the ranks to serve the country in various capacities in both the public and semi- government sectors including Senior Tourism Officer: Marketing, Marketing Officer, Marketing Manager to Director of Marketing, at the defunct Gambia Tourism Authority/ Gambia Tourism Board and Director of Planning, Mo TC.. Given my academic grounding and exposure, I took a cue from one of the earliest and distinguished Secretary Generals of the United Nations Dag Hammarskjöld who once underscored that “faced with the world of others, one learns that he who has fully absorbed what his own world has to offer, is best equipped to profit by what extends beyond its frontiers… the road inwards could become the road outwards”. With this inspiration, I took my assignment and calling in the tourism sector with seriousness and further undertook series of specialized training in destination marketing and tourism management and strategy in diverse centers of learning such as the prestigious University of Bocconi in Milan- Italy, Cyprus School of Tourism Management in Nicosia, Kaoshiung Hospitality Institute in Taiwan, defunt Commonwealth Tourism Centre in Malaysia as well as the Mount Carmel International Training Centre in Haifa, Israel. As such I was proud and honored to be given the chance to promote the Gambia’s unique selling proposition as the Smiling Coast of Africa in diverse countries across the globe with a view to attracting more tourists and visitors. These were exciting times and in the process I cut my teeth as a marketer and promoter of the tourism credentials of destination Gambia. The experience gained is being put to good use as my roles continue to evolve in the context of a tourism and marketing consultant. Other “soyushniki” ( as the graduates of the former Soviet Union affectionately refer to each other) also continue to cut their teeth in various endeavours of national development such as the affable Dr Mbowe, Dr Daffeh, Dr Jagne (AfricMed) , Ndey Marie Njie of the Gambian Embassy in Moscow, Demba Bah – a Deputy Permanent Secretary in the Civil Service and Pierre Gomez – Director of Planning at the Social Security and Housing as well as kalifa Manneh of the AU in Addis not forgetting Assan Jallow – a Permanent Secretary at the Ministry of Agriculture and many others. The current Managing Director of NAWEC Mr Baba Fatajo as well as the Director of Provincial Operations Mr Bakary Kanteh were both“Soyushniki” and studied in Russia. This goes to show that capacity building in Human resources pays and Russian/ Ukrainian trained personnel are known to be hardworking and efficient.. New Gambia should revive such collaboration in the bilateral relations with Russia and other former Soviet states such as Ukraine. Lamin Saho studied International Relations in Ukraine (1990-1996).